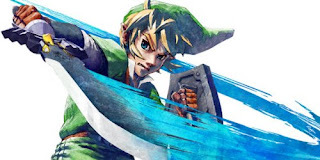 This week at PopMatters, I take aim at The Legend of Zelda: Skyward Sword. Zelda is one of my favorite series, one that I believe usually showcases the best the medium has to offer. Over the years, Zelda games have pushed design philosophy forward, implementing dynamics to which most other games still aspire. Therefore, it brings me no pleasure to say that Skyward Sword is a disappointment. Certainly, there are bright spots. The world is vibrant, the art style is charming, the music is superb, and some of the motion control is enjoyable, although "some" is a very important qualifier in this case (more on that topic in the future). Conceptually, the puzzles and secrets are as clever and inventive as ever. The game's implementation is another story. As I wrote last week, Hanah and I are playing the game together, and our unique gripes about the game started me thinking: who is Skyward Sword's intended audience? I get exasperated by the didactic tutorial sequences, the slow storytelling pace, and the inexcusable technical snafus (such as irritating load times and weird motion control). My wife gets irritated by the game's demanding difficulty and obscure quest design. We are both annoyed by inexplicable rule changes and poorly telegraphed action sequences that both assume a level of familiarity with other game conventions that are neither taught to the player nor suited the franchise's historical design. Making a game for "everybody" is a dangerous course of action, but one that Nintendo probably felt compelled to pursue. After all, the Wii's accessibility was the key to its success, so it's understandable that Skyward Sword would be slowed down and simplified for an audience comprised largely of first-timers. Simultaneously, Zelda is one of the few reasons "core" gamers still come back to Nintendo year after year. Skyward Sword needed to meet their expectations as well. Combine all this with a rapidly changing industry landscape (one that has shifted sharply away from Japanese RPGs and towards action-oriented, set piece games) and you have the recipe for an exceedingly strange brew. Playing Skyward Sword has been a mixture of pleasure, frustration, and outright confusion. It doesn't feel like it was made for any single type of person, and thus ends up feeling like it was made for no one. I was hoping that Skyward Sword would be a game more in line with the more experimental Zeldas: Wind Waker, Majora's Mask, and even the original game. WW and the first Zelda particular were games of exploration, that hid things all over the place just because they could. That's my favorite Zelda play style, but it also seems to be one of the least appreciated aspects off the series. I do seem to recall being able to buzz through text by mashing the A button, but that might just be my memory editing out the N'th time I'm told about the many uses of Hornet Larvae or whatever. Regarding those rather slap-dash mini-game/set-piece moments. I particularly disliked that stupid cart-racing thing on the warehouse island; riding the carts through puzzles was fine, but trying to treat them like slot cars was not. Yet, I still had a wonderful time with the game overall; there were frustrating parts, but for the most part I was totally engaged in figuring out the dungeons, wandering around the quite widespread land areas, and interacting with everybody in the town. But I can certainly see how a less experienced gamer would get stuck on or annoyed by some of the obscure Zelda-isms that feel so familiar to us old-timers. My biggest complaint was: How come the Zelda game with so far the most refined and challenging sword-fighting is also the first one out of the last 5 or 6 to not have a battle challenge mode? You raise a good point about Zelda's sporadic exploratory nature. In many ways, the first Zelda game was a proto open world game: it just dumped you in the game and let you wander around. These last few games have been far more guided. Looking back on it now, I feel like Twilight Princess was actually a pretty good compromise. Maybe I'll replay it to refresh my memory. I actually feel the same as you, unfortunately! There are some things I really like about it, but there's quite a bit that leaves me scratching my head. Re: skipping the text - You actually can make it scroll faster, but cannot make it "pop" in or skip it, as you could in Ocarina and others. Such a weird and pointless change. Anyway, the whole experience makes me extremely interested in what comes next: it feels like the formula is finally starting to break, but I'm not sure Nintendo is willing to reinvent the series again (as they did with Ocarina).